The E-PROPS are ultra-light and quiet propellers, and they have a very good efficiency. They also are very strong propellers. 1- Ultra-Light and Strong : how is it possible ? 2- Why the E-PROPS are very strong propellers ? 3- How can a paramotor propeller break ? In the collective unconscious : a strong product must be heavy, and a heavy product is strong. 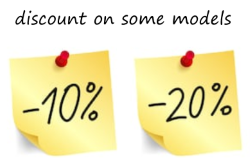 The use depends on the criteria which are the most important for the product. For a specific application, a lighter material can be better than a heavier one. For example, steel is not adapted to make a propeller for big airplanes. It would be far too heavy. So manufacturers are manufacturing such propellers in aluminium, 2.8 time lighter than steel, and which have quite the same ultimate tensile strength (about 500 MPa). Steel is heavier than aluminium, but it is absolutely not the best material to make propellers for big aircraft. For paramotors, the propellers are not made in aluminium. In this case, aluminium is not the best material. Engines have a maximum value of Moment of Inertia. A 2-blade aluminium propeller diameter 125 cm would weight more than 2,5 kg. As a reminder, the same propeller E-PROPS PLUG'n'FLY weights less than 500 gr... 5 times less ! The Moment of Inertia of such aluminium propeller would be far too high and this type of propeller would break the reducer in a couple of hours. 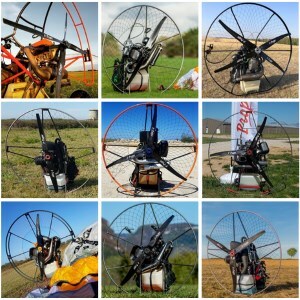 Wood and composite are lighter than aluminium, and are the best materials to make strong paramotors propellers. Composite materials are the best materials for aeronautics, especially carbon, because they are very light at the same time as very strong. 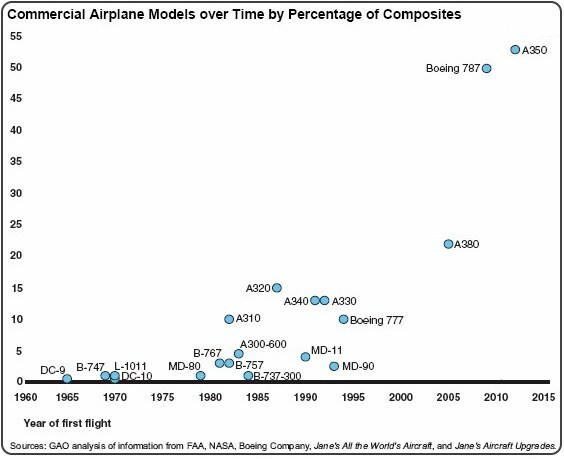 Today, aircraft structures are commonly made up of 50 to 70 % composite materials, including airliners : the Boeing 787 Dreamliner is made of 50 % composite materials, and the Airbus A350 of 53%. There are many types of composite materials and many different manufacturing process. To make very strong carbon parts, the most important is to have the maximum of fibers and the minimum of resin. Fibers is 50 times more resistant than resin. E-PROPS RTM manufacturing process allows to have the hightest fibers ratio on ultra-light parts. Fiber ratio is : carbon fibers / epoxy resin. The gap is very important, because of the ratio, and because the carbon fibers are more resistant than glass fibers. 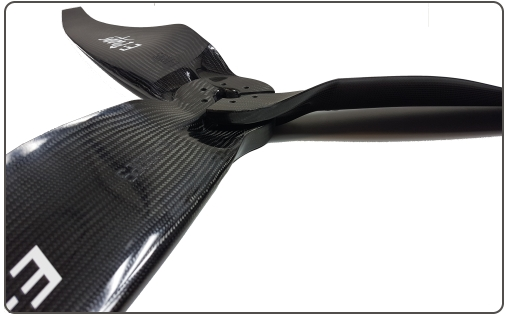 Competing composite propellers are heavier, because usually made in fiberglass, with far more resin, using different process which allows only a very low fibers ratio. They are heavier, yes, but absolutely not stronger ! The ultra-light E-PROPS propellers are stronger than all competing composite propellers. Note : some competing propellers manufacturers do not achieve to make ultra-light propellers, or do not want to make the necessary investments to change their old and non-performing manufacturing process. So they try to find several bad arguments (as "a strong product must be heavy / a heavy product is strong"), which have nothing to do with physics, materials strengths and improved uses. The carbon is the material whichs presents by far the best compromise rigidity / weight for long parts, as blades. The exceptional carbon fiber ratio (63%) allows to make ultra-light parts. An internal spar strongly reinforces the blade. The HCF (Helical Continuous Fibers) process, specifically designed by E-PROPS, ensures an exceptional strength of the 100% carbon + epoxy resin blade, from leading edge to trailing edge, from blade's foot to tip. The carbon fibers ratio of the E-PROPS is very high (63%). It is very important to have the maximum of carbon fibers and the minimum of epoxy resin. Contrary to the traditional "2 glued half-shell" process (used by many propellers manufacturers), fibers are continuous between the intrados and the extrados (carbon braid, made as a sock). The mechanical resistance of the blade is increased and becomes very high : no slightest risk of blade's explosion by delamination of the leading edge, no possible cracks on the blade or on the hub. The leading edge of all E-PROPS propellers is reinforced : E-PROPS injects the epoxy resin with a Nanostrength® impact additive (ARKEMA product: high kinetic energy absorption capacity) on the whole leading edge of the blade. This internal reinforcement, more resistant than a metallic leading edge, leads no detachment and no electrolytic problems. It is extremely resistant. In very special (and not recommended...) cases, as barefoot flights, it is essential to protect the leading edges with a special tape, used on helicopter rotor blades. See Extra Protection : Polyurethane Tape (on sale on this e-shop). The E-PROPS are very light. They are designed and manufactured with continuous fibers, and not in 2 glued half-shell (as many competing propellers), with a very high carbon fibers ratio, and are more resistant than heavier fiberglass propellers. A propeller in good condition never breaks itself. A paramotor is a pusher configuration. The propeller is at the back, behind the frame or the trike and the engine. This position makes it vulnerable to impacts. 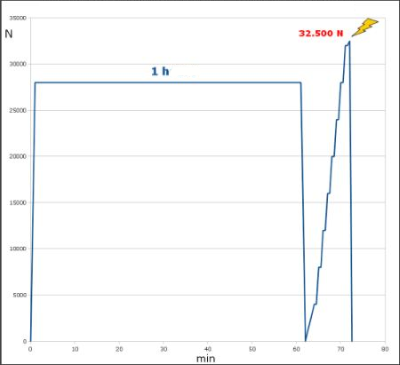 A propeller is running very fast : 3.000 RPM max for a PLUG'n'FLY. It means a speed of 715 km/h at tips for a propeller diameter 125 cm. A small screw, for example a M6x40, would make the same impact on a rotating propeller than a gun bullet of a Colt 45 : same weight, same speed. The propeller can also have been weakened before, for example during barefoot flights without extra-protection on the leading edge. It is important to check the condition of the propeller before flying. The E-PROPS team has made many tests in extreme conditions on their propellers : RPM over-speeding of course and also behaviour during un-symmetrical flights and aerobatics flights. The E-PROPS cannot break by themselves. And remember that a propeller is made to run in the air, not in the ground, or in other materials ! All E-PROPS propellers are tested to see how they resist at centrifugal load test. Centrifugal load tests are very important test in order to define the mechanical resistance of the propellers. In certified aviation (in Europe), they are defined by EASA Certification Specifications for Propellers (CS-P). The aircraft propeller must be tested for a period of one hour to a load equivalent to twice the maximum calculated centrifugal load. The propeller must show no failure or permanent deformation. E-Props has developped an hydraulic load test bench : high : 3,5 m, weight : 300 kg, and maximum load 40 tonnes. All propellers models are tested on this bench. The maximum centrifugal load on a PLUG'n'FLY propeller at 3.000 tr/min has been calculated by the software LmPTR© : 7.000 N (714 kg). In this case, the CS-P for certified propellers says that the propeller must be tested for a period of one hour to a load of 14.000 N (1,4 tonnes). The maximum centrifugal load at 3.000 RPM is 7.000 N, so the safety coefficient of centrifugal load is 4,6. The propeller can hold 4 times the maximal load during 1 hour without any damages. The EASA CS-P for certified aircraft propellers says that the propeller must be tested for a period of one hour to a load of 14.000 N.
The propeller has holded a load of 28.000 N during 1 hour, it means twice what is asked by EASA CS-P for certified propellers.